A plate of South Texas Style BBQ. Potato salad is common in Texas barbecue as a side dish. Texas Barbecue is a traditional style of preparing meat unique to the cuisine of Texas. It is one of the many different varieties of barbecue found around the world. Texas barbecue traditions can be divided into four general styles: East Texas, Central Texas, South Texas, and West Texas. The Central and East Texas varieties are generally the most well-known. In a 1973 Texas Monthly article, Author Griffin Smith, Jr., described the dividing line between the two styles as "a line running from Columbus and Hearne northward between Dallas and Fort Worth". Additionally, in deep South Texas and along the Rio Grande valley, a Mexican style of meat preparation known as barbacoa can be found. In Spanish, the word barbacoa means "barbecue", though in English it is often used specifically to refer to Mexican varieties of preparation. East Texas style: The meat is slowly cooked to the point that it is "falling off the bone." It is typically cooked over hickory wood and marinated in a sweet, tomato-based sauce. Central Texas style: The meat is rubbed with only salt and black pepper or in some restaurants with spices and cooked over indirect heat from pecan or oak wood or mesquite wood or a combination of woods. Sauce is typically considered unneeded but may be served on the side. West Texas style: The meat is cooked over direct heat from mesquite wood. South Texas style: Features thick, molasses-like sauces that keep the meat very moist. The barbacoa tradition is somewhat different from all of these. Though beef may be used, goat or sheep meat are common as well (sometimes the entire animal may be used). In its most traditional form, barbacoa is prepared in a hole dug in the ground and covered with maguey leaves. Central Texas pit-style barbecue was established in the 19th century along the Chisholm Trail in the towns of Lockhart, Luling, and Taylor. The German and other European immigrants who owned meat packing plants opened retail meat markets serving cooked meats wrapped in red butcher's paper-- this tradition continues to this day in many central Texas towns. Also, this barbecue style's popularity has spread considerably around the world, especially to Southern California, New York City, and in Britain and Australia. Today, many barbecue restaurants open around 11:00am and serve until "they are out of meat", most barbecue establishments are closed on Sundays. 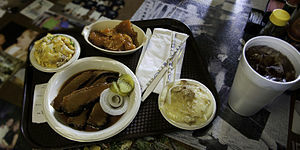 At a typical Central Texas pit barbecue restaurant, the customer takes a tray cafeteria style and is served by a butcher who carves the meat by weight, side dishes and desserts are then picked up along the line with sliced white bread, wavy-cut dill pickle chips, sliced onion, and jalapeno. Barbecue meats are commonly sold by the pound. The emphasis of Central Texas pit barbecue is on the meat, if sauce is available, it is usually considered a side dip for wetting purposes. Calvin Trillin, writing in The New Yorker, said that discussions of Central Texas pit barbecue do not concern the piquancy of the sauces, or on the common side dishes and desserts-- main consideration is of the quality of the cooking of the meats. Smith posits this theory on why sauces are not a focus of Central Texas pit style: in the early days, the noon meat markets were dominated by the upper class purchasers, who could choose among the highest-quality cuts of meat with little interest in sauces. Smith describes many sauces in Central Texas pit barbecue as intentionally made "bland", as compared to the flavor of the meats themselves. The sauce is typically thinner and unsweetened, different than the Kansas City and Memphis styles (which rely heavily on molasses, sugar, and corn syrup to provide thickness and sweetness). Jayne Clark of the USA Today said in 2010 that the "Texas Barbecue Trail" is an east of Austin "semi-loop" including Elgin, Lockhart, Luling, and Taylor. Barbecue eateries in this semi-loop, like Louie Mueller Barbecue, are within one hour's drive from Austin, in a direction of northeast to the southeast. East Texas barbecue is usually chopped and not sliced. It may be made of either beef or pork, and it is usually served on a bun. Griffin Smith, Jr. of Texas Monthly described East Texas barbecue as an "extension" of barbecue served in the Southern United States and said that beef and pork appear equally in the cuisine. Smith further described East Texas barbecue as "still basically a sandwich product heavy on hot sauce." West Texas barbecue, sometimes also called "cowboy style," traditionally used a more direct heat method than other styles. It is generally cooked over mesquite, with goat and mutton in addition to beef. Barbecue in the border area between the South Texas Plains and Northern Mexico is mostly influenced by Mexican cuisine. Historically, this area was the birthplace of the Texas ranching tradition. Often, Mexican farmhands were partially paid for their work in less desirable cuts of meat, such as the diaphragm and the cow's head. It is the cow's head which defines South Texas barbecue (called barbacoa). The head would be wrapped in wet maguey leaves and buried in a pit with hot coals for several hours, after which the meat would be pulled off for barbacoa tacos. The tongue would also be used to make lengua tacos. Today, barbacoa is mostly cooked in an oven in a bain-marie. ^ a b San Antonio, Austin, & the Hill Country. New York: Fodor's. 2008. p. 151. ISBN 978-1-4000-0718-9. Retrieved November 17, 2015. ^ Smith, Jr., Griffin (1973). Texas Monthly. p. 38. ISSN 0148-7736. Retrieved November 17, 2015. ^ a b c d Smith, Jr., Griffin (1973). Texas Monthly. p. 40. ISSN 0148-7736. Retrieved November 17, 2015. ^ a b c Walsh, Robb (2002). Legends of Texas Barbecue Cookbook: Recipes and Recollections from the Pit Bosses. San Francisco: Chronicle Books. p. 29. ISBN 978-0-8118-2961-8. Retrieved November 17, 2015. ^ Walsh, Robb (August 24, 2000). "The Art of Smoke". Houston Press. Retrieved November 17, 2015. ^ "By Meat Alone". The New Yorker. November 24, 2008. Retrieved November 17, 2015. ^ Clark, Jayne (May 27, 2010). "Hot on the trail of some smokin' Texas barbecue". Usatoday.Com. Retrieved November 17, 2015.